• Licensed by Health Canada to improve oral health! Fights Bad Breath & Improves Oral Health! 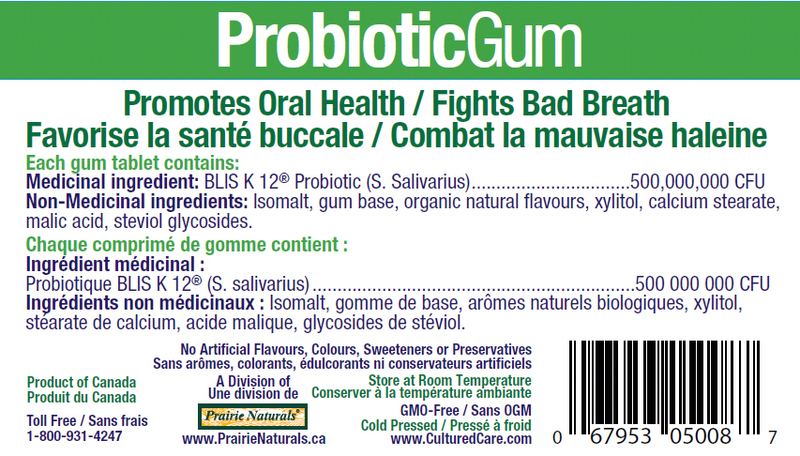 Canada’s first and only probiotic gum recognized and licensed by Health Canada to fight bad breath and improve oral health! Our tasty chewing gum is the revolutionary delivery system for this unique oral probiotic and ensures the most effective distribution in the mouth. Infection protection starts in the mouth. 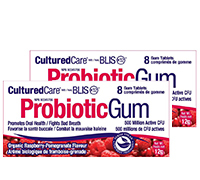 With 500 million friendly bacteria, CulturedCareTM Probiotic Gum provides the mouth with the probiotic protection and resistance it needs to fight the bacteria that cause bad breath. It is also recommended for us after antibiotic use to re-colonize the mouth with the health-promoting bacteria that are destroyed by antibiotics. Made exclusively in Canada using proprietary technology that ensures the live probiotic bacteria remain active and effective. Organic flavours. 100% VEGAN. Gluten-free! Contains NO artificial flavours, colours, preservatives or sweeteners, No GMO ingredients.